My book club just finished reading Mother of Rain. Have you read it yet? If you like historical fiction, WWII novels, Southern fiction, Appalachian story-telling, this is the book for you. But don't take my word for it, I am kind of biased when it comes to this book. So go read what others have to say on Good Reads and Amazon. Then hop on down to your local bookstore and pick yourself up a copy. You can thank me later. My book club met yesterday to discuss Maizee's story. 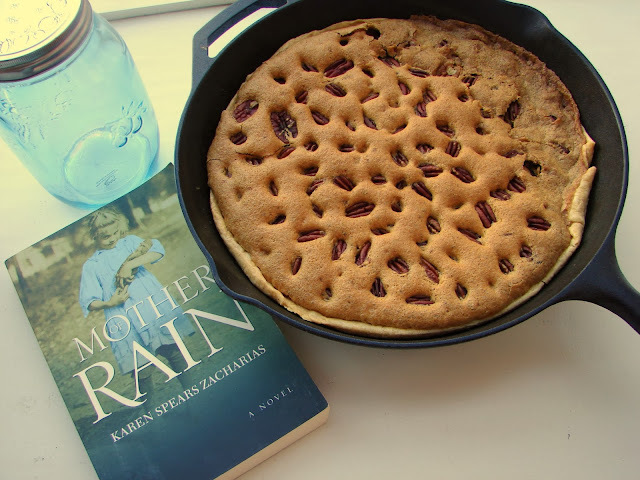 Since I love a good thematic party, I made a very southern pecan pie in a cast-iron skillet for the occasion. I got the recipe from none other than Southern Living. It's called Utterly Deadly Southern Pecan Pie. How's that for a name? Here's the link to the recipe if you want to give it a try. Even if you don't make yourself the pie, go get a copy of Mother of Rain. You won't be sorry you did. You making that pie for Thanksgiving?